Costa-Gavras’ Missing (1982) was part of an exciting trend in early 1980s cinema that included films like The Year of Living Dangerously (1982), Under Fire (1983), The Killing Fields (1984), and Salvador (1986) – powerful, politically-charged exposes of injustices happening all over the world. In the case of Missing, it dramatizes the search for American filmmaker and journalist Charles Horman (Shea) who disappeared rather mysteriously during the 1973 coup in Chile. Horman’s wife Beth (Spacek) and his father Ed (Lemmon) go looking for Charles and are met with bureaucratic resistance from consulate officials at the United States embassy. The film begins with Charles and Beth living in very volatile conditions. At any given moment they hear gunshots outside and the military has imposed a strict curfew. People are taken off the street and some are shot. In fact, Charles has been doing a story about the military killing thousands of people. There’s a scene where Beth makes her way home through the city streets during the curfew deadline that is tense as soldiers ogle her. She hears gunshots, sees a dead body, and is eventually forced to hide for hours. There is a real sense of fear in this scene as soldiers either arrest or shoot people out after curfew. Beth finally makes it back home to find it ransacked and Charles missing. Ed speaks to someone at the State Department and is typically given the runaround. He then speaks to his congressman and is given more hollow reassurances. Ed decides to go to Chile to find Charles with Beth’s help. Jack Lemmon is an inspired bit of casting as we instantly sympathize with him thanks to the fierce integrity he exudes and the sad, sympathetic eyes that convey so much. Initially, he has faith in his government with his conservative values but over the course of the film, this belief erodes as he hits one bureaucratic dead end after another. Lemmon is such an empathetic actor that we can’t help but share his mounting frustration. The second disc starts off with two video interviews with Costa-Gavras – one done just after Missing’s U.S. premiere and one done for the 2006 French DVD. In the first interview, he addresses the controversy surrounding the film – the U.S. administration did not like the parallels to the situation in El Salvador at the time. The second interview features the director talking about the origins of the project. Charles’ wife, Joyce Horman (played by Spacek in the film) is interviewed and talks about the accuracy of Missing. She feels that it was lenient on the portrayal of the U.S. government. Joyce talks about how and why she and Charles were in Chile. She also offers her impressions of what it was like there at the time. “Producing Missing” features producers Edward and Mildred Lewis and Sean Daniel, and writer Thomas Hauser, author of the film’s source book, discussing the making of the film. The Lewis’ talk about how Hauser’s book motivated them to get the film made. Hauser talks about what drew him to the Charles’ story. This is an excellent look at how the film came together by the people who worked on it. “1982 Cannes Film Festival” features Costa-Gavras, Jack Lemmon, Ed and Joyce Horman with family friend Terry Simon are interviewed at the festival. Lemmon talks about what drew him to the film while the Hormans talk about their experiences and what they think of the film. “Pursuing the Truth” is an interview with Peter Kornbluh, director of the National Security Archive’s Chile Documentation Project. He talks about declassified documents pertaining to the U.S.’ involvement in the execution of Charles. Kornbluh provides fascinating background to the political background of the film. 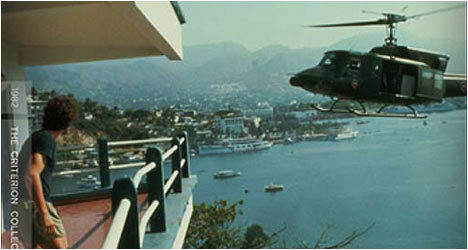 He also examines how the film is very critical of U.S. involvement in Chile and they helped bring about a coup d’état. Finally, there is “In Honor of Missing,” an excerpt from a 2002 event by the Charles Horman Truth Project to support efforts to bring General Augusto Pinochet and others to justice for human rights violations. Actor Gabriel Byrne hosts the ceremony and talks about how the film changed him. Costa-Gavras and some of the stars from the film also speak.